Girl with a Pearl Earring: SALE TIME!!!! SALE, the 4 letter word that invokes a 100 million emotions and that too happy ones. In this part of the world the word is literally unheard of. I had my first tryst with SALE shopping back at Bangalore and unfortunately before I could fully understand the depth of the word and exploit it to full potential it was already Feb 1st week. The SALE stock was nearly exhausted and all of us returned vouching to hit the sales early next time around. The next time for me sadly didn't happen as I was transferred to Cochin. This season too I had zero hopes of hitting SALES as I was stuck at Cochin. When Dad announced that, we will be going to Palakad (3 hours from Cochin) to attend festivities at Dad's BF's place I was more than happy. Coimbatore, which is 2 hours drive from Palakkad house most of the retail stores, Pantaloons, Westside, Lifestyle, and Max. I nudged dad to spend a day at Coimbatore but, Dadiji didn't take to that request quite kindly. Finally after much pressurizing he obliged and off we went to Coimbatore on Saturday morning. After a mini shopping at Ganapati silks (pre-wedding shopping) dad wanted to wind up and leave early so as to reach Cochin by evening. 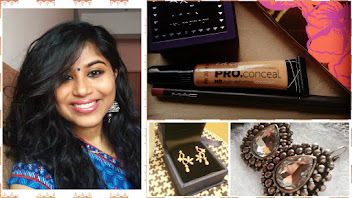 I nudged mom and twisted her mind so as to make her believe that now that we have come to Kovai, we should explore more options and check out other shops also. Dad was not very happy with this decision though he tagged along. Off we went to Brookefields mall, 20 minutes drive from Gandhipuram on pretext of visiting RMKV. We couldn't find any good sarees at RMKV, fearing Dad's wrath I bought myself a pink kancheepuram saree (I love it!!!). The store manager asked us to wait for 10 minutes so that they can weave the ends. I pulled my mom, asked dad and grandpa to wait for us at RMKV and ran to Lifestyle, 10 minutes that's all we had. We entered through the men's section at 3rd floor. Saw so many awesome tees, something that I would buy for my brother whose Birthday is on 15th of Jan but, alas with little time me and mom ran to the lower floor housing bags and shoes. 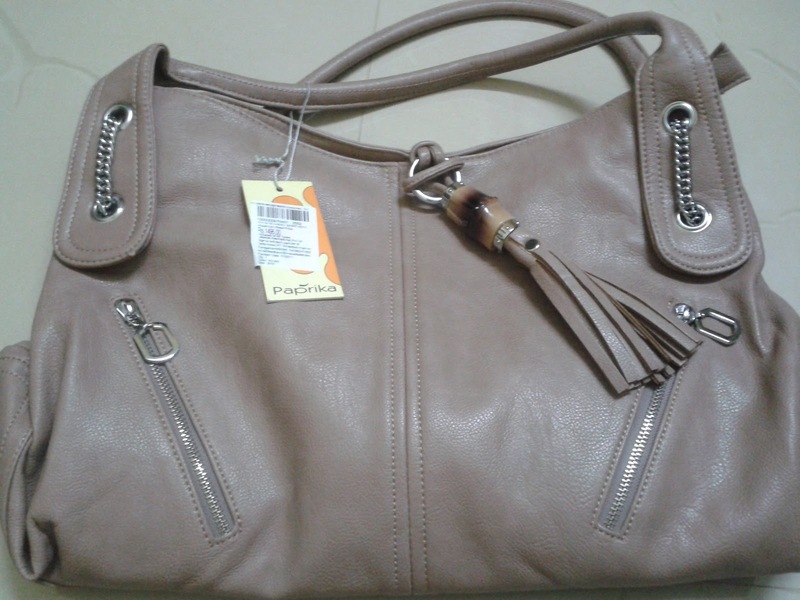 Mom bought a paparika bag originally retailing at 1500 INR now marked at 50 % off. 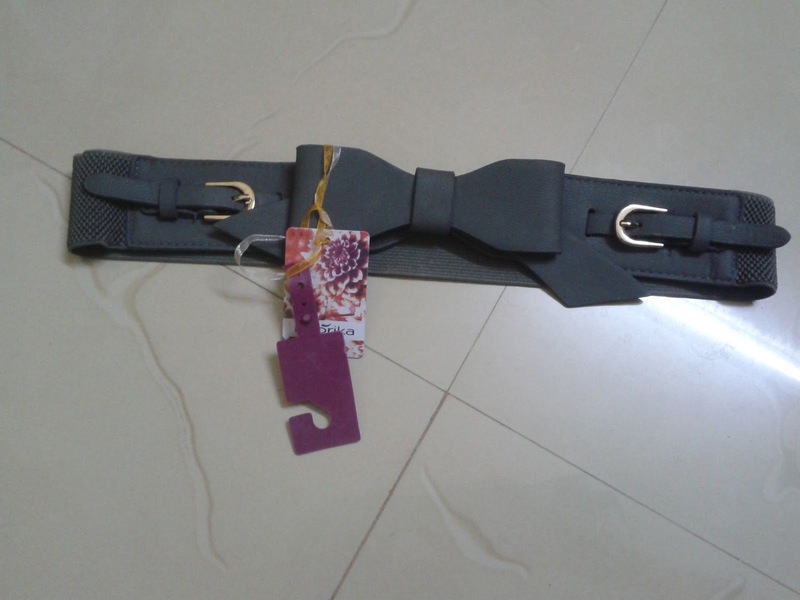 While I was searching for a wide belt, dad called me twice( I ignored it :)) I did find something that I had in mind at 250 bucks after 50 % discount. I soo wanted to buy some cute flats too but alas didn't have enough time to try em on. We ran to the lower deck and off I went to Ginger section, my favorite section of whole of lifestyle. 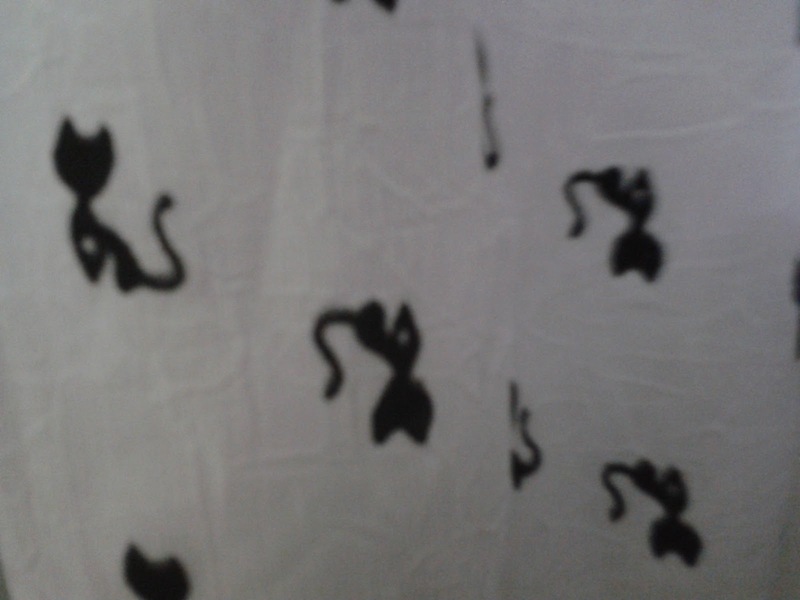 I found this free size cat printed cute top. After trying it on I ditched it cause, I felt it was not Too flattering but, mommy dearest loved it so much that she suggested that I use a thin belt to break the top and to give it some structure (Mom is learning things fast I must say). 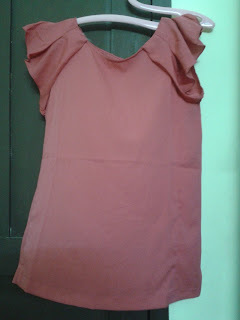 By the way the top retailed at INR 629 after discount. I went to my another of my favorite section, CODE and picked up a cute casual top in Yellow (My favorite color). Mom didn't like it and instead asked me to pick the same top in coral. The top retails at INR 559 after discount. I picked up an ash top and a black shirt too. The ash satin shirt like top was clinging on to my bumps and made me uncomfortable though, mom loved it. I picked up the black shirt and went in to the billing counter and that's when I saw it. 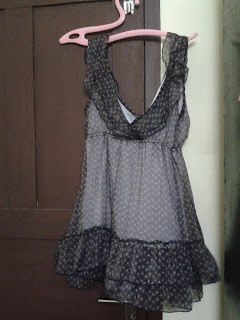 I nearly bought this very top on my trip to Delhi, but later put it back to the rack cause I couldn't wear something like this in Cochin even with a spaghetti. I cringed about the top for 2 days after and here it was on rack for INR 799 after discount. I quickly dumped my black shirt and billed this instead. By this time, I had started to receive threatening calls by Dad:(. He wanted us to be back at RMKV immediately. So, I couldn't hit Westside or Pantaloons or even accessories section in Lifestyle( I am so gonna regret it). 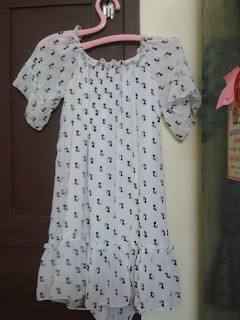 Last but least, I would like to share pics of my mini haul from violetbag. I am in a serious tangerine stage, I love anything remotely orangish and hence this Revlon Nail paint in tangerine. 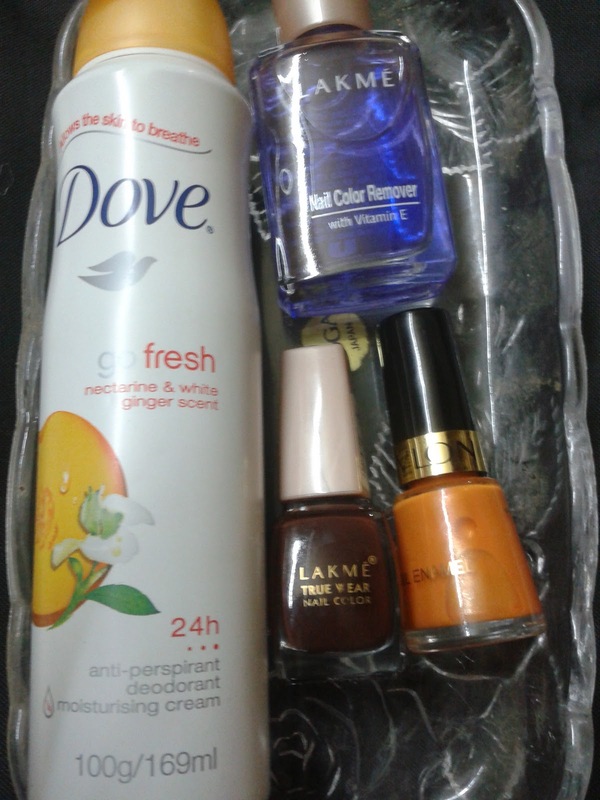 I don't have any chocolate shades in my vast nail polish range and therefor Lakme nail polish in chocolate brown. So, what are your thoughts about SALE season and my mini haul?. Would love to hear:). PS: We went back to Ganapati silks for rest of the shopping, all the while hearing Dady dearest telling me that we should have shopped the bulk lot from Ganapati silks itself. My mom shopped like there is no tomorrow and that explains 20 sarees we had to carry on our way back. Also, please ignore the poor quality of pics, I don't own a fancy camera:(....I will find out a work around as fast as I can. That was quite a buy...I loved that kitty print top...too adorable. Didn't you get the multi layered chains that you were searching for?? I saw some at Pantaloons today for around 250-300 bucks... first thought was you :D.
Bestie was in a hurry,so couldn't buy anything..hope to check out the other store tomorrow. Btw, I picked up tangerine and kept it down, swatch it will you? and don't be sad about Kochi, you have fort kochi to go to and those lovely art galleries.yes, sales are better but they are on for a limited time, remember? That bag is a steal and I loved that cat print top. Got to look for it next time at Lifestyle!! Wow!!!!!! i luvd everythin!!! bag iz beautiful, top is amazing, belt is awesome and Gosh!20 sareessssssssss....... hahhaaaa guys, wat were u thinkin!!??? such a cute haul! I love the bag!! and I really like doves new 'fresh' range...the shower gels smell sooooo amazing!! 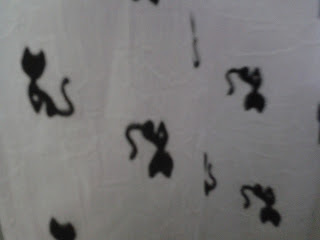 The cat print looks pretty cool. @Uruj, every girl's dream period...SALE SEASON!! !